The Via Group Explores the challenges, opportunities, and benefits of migrating to Microsoft Lync Enterprise Voice inviting people to see it in person with the Microsoft Experience Center (MEC). Learn how SIP Trunks can offer significant cost-savings for enterprises. Learn how SIP Trunks can offer significant cost-savings for enterprises. Microsoft® Lync® Server 2010 converges an organization's communications channels to create a rich, interactive environment that unifies enterprise voice, presence, instant messaging, and multimedia conferencing into a new, more connected experience. Visitors can sign up for a day packed with integration tips, solutions, and an opportunity to meet with award winning design engineers and hands on time with the Microsoft Experience Center. Attendance is limited to the first 25 respondents, with a maximum of 2 representatives per company. Attendees are automatically entered into a free drawing for a network assessment valued at $2500 (two assessments will be awarded). Recommended Audiences: Technology Executives, IT Managers, IT Professionals, CTO, IT Directors. 9am - 10:30am: What Can Lync Do For You? Please join Microsoft and The Via Group for an interactive session on Lync Unified Communications, and how it best serves people and business. 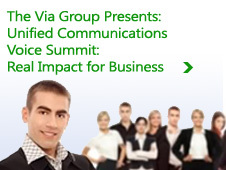 This will be a technical discussion of challenges, solutions, and opportunities for voice integration with Lync. Level3 will discuss the network component of the total Unified Communications solution, specifically how issues such as E911 on the Microsoft Lync platform are handled by next generation networks. Level3 will also discuss real life examples of the challenges faced by mid to large size customers in migrating legacy TDM environments to their SIP platform and the best practices they have developed to ensure transitions can happen with minimal impact on the end users. SoftwareOne will clarify any confusion around multiple software licensing programs, licensing implications with solutions such as virtualization and cloud. The Microsoft Experience Center (MEC) provides a hands-on environment and a set of scenarios that create an interactive user experience with the latest Microsoft business productivity platform solutions. It helps participants realize the complete value and possibility of these powerful collaboration solutions and how they can be leveraged to improve business productivity in their own organization. High level technical resources will be on hand to answer questions and coach your personal experience with Microsoft UC and UC-enabled apps. Via is a premier provider of communications solutions that span the full range of new and established technologies, including Voice, Video, Instant Messaging, Presence, Voice Messaging, Conference and Collaboration, and bringing them together into multi-vendor solutions. They are responsible for some of the largest Lync and OCS Enterprise Voice deployments in the world and will share expertise on coexistence, migration, and how to move to Lync painlessly. Level3—Level3 Communications, Inc. is a premier global provider of IP-based communications services to enterprise, content, government and wholesale customers. Over its reliable, scalable and secure network, Level3 delivers integrated IP solutions, including converged, data, voice, video and managed solutions to help enable customers' growth and efficiency. SoftwareONE—SoftwareONE is a licensing solutions provider with the unique combination of being truly global, fully-focused on software licensing and privately-owned since 1985. The software licensing experts take a consultative approach to helping customers optimize their software spend, while enhancing their relationships with software publishers and local service providers. NET—NET delivers high performance networking equipment optimized for real-time communications. NET has delivered solutions for multi-service networks requiring high degrees of versatility, security and performance. Today, the company is focused on providing secure real-time communications for unified communications, SIP trunking, enterprise mobility, and IP-based multi-service networking. About The Via Group Inc. The Via Group is a globally recognized leader in providing Professional Services supporting Unified Communication solutions. As a leading solution provider and Gold Certified Partner for Microsoft, Via is a premier provider of communications solutions that span the full range of new and established technologies, including Voice, Video, Instant Messaging, Presence, Voice Messaging, Conference and Collaboration, and bringing them together into multi-vendor solutions. The Via Group takes pride in offering business solutions based on a foundation of IT and Voice experience, technical expertise and solid project management practices. Our Microsoft Certified Engineers, Trainers and Professionals focus on Unified Communications solutions while our Certified Voice Engineers focus on integrations to provide a complete UC solution. Services include Discovery, Consulting, Architecture Design, Deployment and Support in both the IT and Voice environments.